Attendees at a previous session organised by North Tyneside Council to find local tradespeople to join its books. Skilled professionals are being invited to join North Tyneside Council’s books. From April next year, construction, housing repairs and maintenance services – currently delivered by Kier North Tyneside – will return to direct management of the authority. The council is holding a series of events to help local tradespeople and small businesses join its books to have access to regular work. The next sessions – on November 20 and 22 – are aimed at trades such as plumbers, joiners, painters and electricians, plus specialist trades like masonry and joinery manufacturing. The sessions follow a series of successful events held earlier in the year where 360 people came along to find out about the different opportunities. 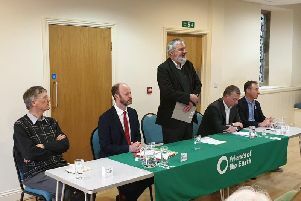 Coun Steve Cox, cabinet member for Housing, said: “The sessions are open to any small business, sole-traders or those who are self-employed and based locally. The sessions take place from 6pm to 6.45pm or 7.15pm to 8pm on November 20 and 22 at The Parks Sports Centre, North Shields. Registration starts 15 minutes prior to the start of the sessions. Places must be booked in advance – email Construction.Project@northtyneside.gov.uk or call (0191) 643 7717 to book.